Home > Shop By Brand > Mighty Mini Tools & Accessories > Mighty Mini Cordless Polisher FREE BONUS! For a limited time only, receive a 3 pack of 3 inch Might Mini Pads (1 Burgundy, 1 Blue, and 1 Black) FREE with your purchase! Make the small stuff sweat you! 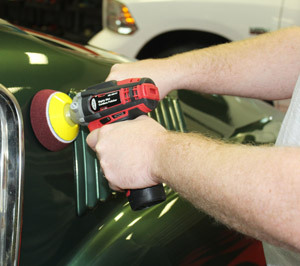 Your car is composed of many different sized panels and surfaces, not all of which are easily accessible by your average buffing tool. However, just because these areas are not easy to buff does not mean that they do not need to be maintained just like the rest of your car. In fact, because these areas are often left neglected, they tend to require even more work than your hood or side panels. The only way to effectively correct these areas is to use a tool that makes working on small or inconspicuous areas a possibility. 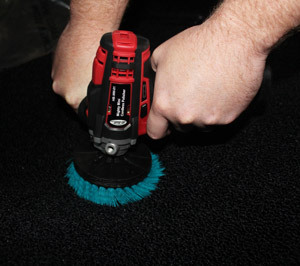 The Mighty Mini Cordless Polisher comes with a 3” backing plate that makes working in tight areas a breeze! The Mighty Mini Cordless Polisher can even be used with a smaller backing plate to allow access to even smaller, harder to reach surfaces. Use the Mighty Mini 3 inch Cordless Polisher to polish small areas of paint or turbo-scrub your carpet and upholstered surfaces! The Mighty Mini Tool is perfect for either or! 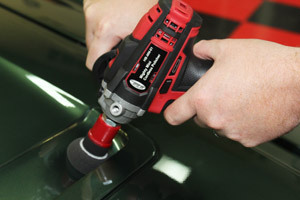 Weighing in at just under 3 pounds, the Mighty Mini Cordless Polisher can be easily maneuvered to deftly reach the surfaces of your vehicle that had been previously neglected out of necessity. On top of this, the Mighty Mini Cordless Polisher is completely cordless, offering you the freedom that comes along with not being chained to the wall by a pesky cord. For the detailing job where you need to be able to cut and cut quickly, the Mighty Mini Cordless Polisher can reach speeds up to 8300 RPM! Generating more than enough power to tackle the tougher polishing jobs. However, not every detailing job needs a full-speed, full-power approach. This is why the Mighty Mini Cordless Polisher come with a variable speed design that allow you to select which speed and power level is necessary to achieve the required correction potential for your detailing job. The Mighty Mini Cordless Polisher has a variable speed design that makes it easy to adjust your polishing process to what is needed for your detailing process. In the absence of a cord, the Mighty Mini Cordless Polisher is powered using a 12V Li-Ion, two of which are included with the polisher. These batteries will keep you polishing for hours! The power indicator on the side of the machine lets you know when your battery is getting low and needs to be switched out. When you switch batteries, the 110V included with the Mighty Mini Cordless Polisher charger lets you charge up the dead battery while you continue your polishing job, limiting your down time to an absolute minimum! 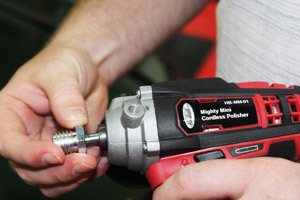 While the Mighty Mini 3 inch Cordless Polisher comes equipped with a 5/16" thread for DA backing plates, a drill adapter can be used to convert it to a rotary polisher! Once converted you can use the Mighty mini Rotary Backing Plates - much more versatile than your standard polisher! Note: This machine cannot be used with the Mighty Mini Rotary backing plates unless an adapter is used. Additional discounts not applicable on this item.